My last two posts covered my most important lessons for attracting your webinar audience and engaging your webinar audience. Let’s now complete the arc with how to convert your webinar audience into customers and future advocates. Use industry disruptions to your advantage. Develop an audience profile that aligns with your topic and value proposition. Consider external thought leaders as speakers versus internal company experts. Gather and mine actionable life cycle intelligence. You can review the full post here. Deliver on what you Promised in the webinar invitation. Use the invitation to architect the content structure, timing, and flow. Coach your speakers to connect with and inspire your audience. Optimize audio to connect with your audience. Optimize audience engagement with table reads and dress rehearsals. Now that we’ve discussed how to attract and engage your webinar audience, the real work begins. After the webinar has gone live, you’ll need to identify which registrants or attendees are sales-ready, which need more nurturing, and which just aren’t a fit. Here are my top five post-webinar priorities to begin your sales follow-up. The webinar was a huge success, you exceeded both your registration and live attendance goals, and your speakers and marketing team have given you kudos on a job well done. You also received some nice thank-you emails from attendees who appreciated what they learned at the webinar. Now it’s time to do some very important housekeeping to keep the conversation going with your audience. One of the most important post-webinar tasks is to send thank-you emails to all of the attendees and no-shows. This helps keep the webinar fresh in their minds and should be done within the first 24 to 48 hours after the webinar. Some webinar hosting platforms have this capability built in. Alternatively, you can have this sent out using your marketing automation platform. Either way, it’s easy to personalize your message and send out your thank-yous when you’re ready. In the thank-you emails, include a link to view the webinar on-demand and instructions on how they can receive more information. Whether you decide to host a recording of the entire webinar or use highlights as part of your nurturing campaign strategy, be sure to leverage the webinar recording as “the content marketing gift that keeps on giving.” It can be reused for other marketing purposes, including content for your website, social media channels, and blog. If your webinar hosting platform provides you with a downloadable recording file, it’s a good idea to edit the recording to remove all housekeeping instructions, as well as “airbrush” out any recording flaws and excessive “ums,” “ahs,” or long pauses. An editing tool such as Camtasia is a powerful and easy way to streamline your recordings and make them more engaging. Plus, this makes it easier and more enjoyable for your on-demand viewers who don’t need to listen to instructions on how to vote in a poll or send in a question. Some webinar hosting platforms do provide this capability, so edit accordingly. While you’re at it, take an extra moment to send a personal thank-you to all of your speakers and anyone else who helped produce and deliver the webinar. They’ll appreciate being acknowledged for their participation. In my first post on attracting your audience, I mentioned the importance of gathering and mining actionable life cycle intelligence to benchmark and predict outcomes before the webinar, including demographic information and the all-important “what do you want to learn from attending this webinar.” During and after the webinar, you will collect other data from online polls and surveys. This data reveals, both at the summary and individual level, how the webinar performed and how to best follow up with each attendee. Your data collected during and after the webinar will come from either your marketing automation platform or your webinar hosting platform, or a combination of both. Pay special attention to the following key metrics during and after the webinar to benchmark performance and segment your follow-up actions. The Attendee Ratio is the ratio of people who attended to people who registered. The higher the attendee ratio, the more confident you can be that you hit the sweet spot of your demographics. A typical ratio is around 30 percent. If it is 40 percent or above, you’ve got a strong indicator that the audience was interested in attending live—a good sign for your post-webinar follow-up! The Online Poll Response Rate will let you know the audience’s level of engagement and interest in the webinar. The actual poll results will tell you what’s important to them and will arm you with information about your audience to use during follow-up. A poll response rate of 70 percent or above indicates that the audience was engaged during the webinar. The Audience Retention Rate is the percentage of people who stay on the webinar. This measures engagement and interest in your webinar by seeing how long attendees will stay in session. A solid performance benchmark is to have at least 80 percent of the peak audience still on by the start of the Q&A section. If your number is much lower, it indicates audience disappointment; you didn’t deliver what you promised in the webinar invitation, or your speakers were less than inspiring. Another data point for evaluating life cycle intelligence is to have attendees fill out a short survey that can be completed as they log off the webinar. Depending on the questions you ask, the Post-Webinar Survey can tell you how the webinar met the attendee’s expectations, what they liked, what could have been done better, and what other topics they’d be interested in learning about. You could also ask if they’d like to be contacted to set up a demo or one-on-one meeting. It’s perfectly fine to ask this after you’ve delivered on your webinar promises. From a qualitative perspective, using a scale of 1–5, with 5 being the highest, ask them how the webinar met their expectations. You’re in good shape if at least 80 percent of the audience rate the webinar a 5, 4, or 3, with no more than 20 percent saying it barely met or didn’t meet what they had hoped to learn. A good response rate for completing the survey should be between 25–45 percent, as this also measures engagement. This data will be very helpful at the individual level for knowing how to follow up. For webinars that include a tutorial or “how to,” you can also ask whether or not the webinar increased attendees’ plans to purchase. Ask, “Having attended today’s webinar, your plans to purchase or acquire products or services: (A) Increased, (B) Was just researching, but now intend to acquire, (C) Was just researching and now see no need, and (D) Decreased.” These answers will go an incredibly long way in helping you separate attendees for sales or nurturing follow-up. These key metrics are what pull all of your hard work together and tell you where the sales and nurturing opportunities are. But while the raw data is important, it won’t do the following-up for you. Let’s see how we can turn this data into action. Sales-Ready: These people asked directly for a sales meeting, requested a free trial or a demo, or asked for more information. They are ready to be contacted. Needs Nurturing: These people rated the webinar highly, want more information, and asked questions/had high participation during the webinar. They may not be ready to buy now, but they want to stay informed. Not a Fit: The people who aren’t a fit have profile data that is not compatible with your ideal prospect. This person could be a student or someone from an industry that isn’t a good candidate for your product or service, or maybe they rated the webinar poorly and didn’t find it of value. You’ll need to dive deep into each attendee’s registration information to get their demographics and pair that with the key metrics gathered during and after the webinar—their individual response rate, retention rate, and their poll and survey results. In addition, consider the live questions asked during the Q&A. Some of these questions can indicate an interest to be contacted and a desire to learn more about how you can help them. Once you segment the prospects, you’ll want to hand off the sales-ready leads to the sales team. When handing off leads, it’s important to remind the sales team that the purpose of the webinar was to educate and inform. The lead isn’t necessarily ready to buy now, but they are warm and ready to be contacted with more information. You won’t need to contact the “not a fit” group beyond sending the thank-you emails. For the “needs nurturing” group, you’ll want to start a post-webinar nurturing campaign, which I’ll talk about next. The goal of the post-webinar nurturing campaign is to re-engage interested registrants and move them on their sales journey toward becoming your customer. (highlight to tweet) This group has indicated to you that they enjoyed your webinar and want more information. Now is the time to keep the conversation alive by providing them with more concrete information to help them on their journey to make a more informed decision. Based on analyzing all of the life cycle information, you should be able to determine what type of informative, free content will help them become more educated. For example, it could be sharing some case studies, white papers, research reports, or even an e-book or other on-demand webinar. A good approach is to send them a follow-up email with a light, friendly tone and tell them what they can expect in terms of communication. Don’t forget to let them know who they can contact if they’d like to set up a one-on-one meeting. Establish lead nurturing objectives, a call to action, and desired outcomes. Create a table of assets of the content you want to use for the campaign. Schedule and send a series of follow-on drips to all that qualify for the nurturing campaign, and then on subsequent drips, only send to those that have actually opened a previous email. This allows you to focus on those that are truly interested and eliminates potential fatigue, freeing your list from those that aren’t interested. Analyze results to determine follow-up after each drip as to who opened their emails and what assets they clicked on. Measure Webinar Success and Get Ready for the Next One! To measure the success of your webinar, compare your initial success factors with the actual webinar outcomes. For example, did you attract your target audience? Did you meet your goal regarding registrants and attendees? The ultimate measure of webinar effectiveness is whether or not the webinar moved the attendee’s intent to purchase (followed, of course, by an actual purchase). The results of the final survey question regarding intent to purchase will give you a quick answer, but also, look at how many net new deals were closed after handing off the sales ready leads. Additionally, how much did you increase your sales pipeline with fresh new leads? Did the webinar leverage your thought leadership to put you on the map as a viable brand? Did you reach new geographies and markets? Were you able to up-sell and cross-sell to your existing customer base? These are all important in measuring webinar effectiveness. These answers will help you improve your next webinar. In fact, I highly recommend you consider doing a series of webinars. Multiple webinars allow you to make multiple impressions on your prospects and attract new ones. Webinars promote your thought leadership. 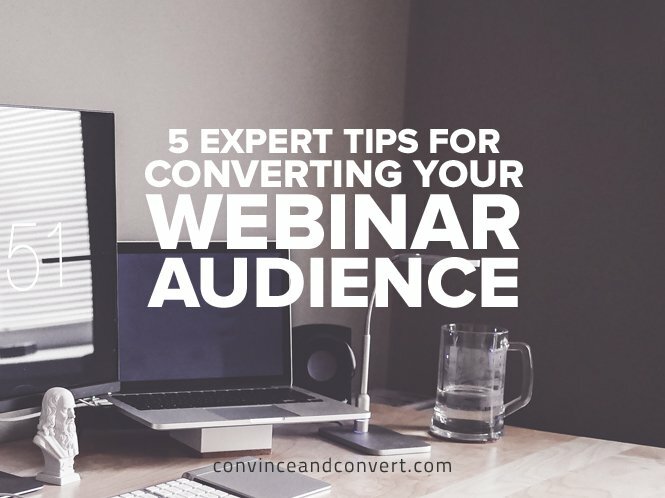 The more webinars you do, and the more information you give, the more your audience will look to you as their trusted adviser and not just someone who is trying to sell to them. This is why they will become your customers and advocates. This post series on attracting, engaging, and converting your webinar audiences will help you meet or exceed your commercial outcomes while delighting your audience who achieved value from attending your webinar. Done right, these tactics for a demand generation webinar will positively affect your brand and thought leadership. Most importantly, it will help you educate your audience on their journey to make a more intelligent decision and become your future customer and advocate. For more information, please avail yourself of any of our complimentary eBooks on hosting successful webinars, or consider enrolling in our online courses to become a Certified Master Webinar Producer by visiting us at Webattract.com. WebAttract has provided our Convince & Convert readers a 10% discount off any of their Master Webinar Training Courses, which you can learn more about here. During enrollment use promo code VIPHUGJAY. This offer is good until May 31, 2016.